When I was in college, my parents owned a small coffee shop on Main Street. The Old Time coffee shop was bordered on one side by a dusty shop that sold random tchotchkes (think ceramic pigs with Paris, Tokyo, New York, etc. printed in sparkly letters) and on the other, by a hair salon where the owner always gave you a Farah Fawcett haircut because she was too busy yelling at her pet parrot in Chinese while cutting your hair. Across the street, there was a grocery store with crispy Peking Ducks hanging in the window and in the back, it sold the best empanadas, chow mein, and burritos. All under one roof. Main Street was a lot like the Mission in San Francisco. Diverse and vibrant with a very clear pulse. Old Time was well, old. The tables and chairs creaked. The sign with the daily specials was faded. And the back wall of the shop was occupied by a large rickety bookshelf housing yellowed, dog-eared copies of Dickens and Dostoyefsky which was strange because no one ever came there to read. In short, there was nothing "cool" about it. No baristas with edgy tattoos and piercings, no Indie music streaming, and definitely no trendy, hot patrons. See, Old Time was frequented by regulars who came in like clockwork and were as much fixtures of the place as that massive bookshelf. Old Andy who wore a different trucker hat everyday and sat outside, chatting with folks who passed by. Ms. Maria who worked as a housekeeper for the fancy houses in the "nicer" part of town and who ordered in rapid fire Spanish before running to catch the bus. And Mr. Adam who owned the vitamin store two doors down and popped in every hour for a potent espresso that he said, "kept him ticking." Mr. Adam was a bit of a celebrity on Main Street because he had his own radio show. On vitamins. One summer, my parents scored me an exciting summer gig, covering for Mr. Adam at the vitamin shop while he was away every afternoon doing his radio show. I knew nothing about vitamins except that I preferred the gummy variety so I mostly sat behind the counter looking bored and fending off Mr Adams's vitamin groupies until he returned. What Old Time lacked in cool, it made up for in pastries. Giant, moist slices of banana bread, danishes the size of my head, and my personal favorite, crumbly blueberry bars. There were also date bars and cranberry bars but they always lacked in comparison to those perfectly dense blueberry bars. All of the pastries were baked and delivered by Sao, a giant Brazilian man with a clear Soup Nazi disposition. If you didn't place the next day's pastry order by 5 pm, well, no pastries for you! A few years ago, Main Street underwent gentrification of sorts. The hair salon was sold to a spiky haired man in tight leather pants and a pinstriped vest. Mr. Adam passed away and the vitamin shop became a gluten free bakery. And a chain coffee shop with a globally recognized logo waltzed in down the street and Old Time all but withered away. There are days when I think of Old Time and how it helped put me through college and how the patrons taught me about diversity. 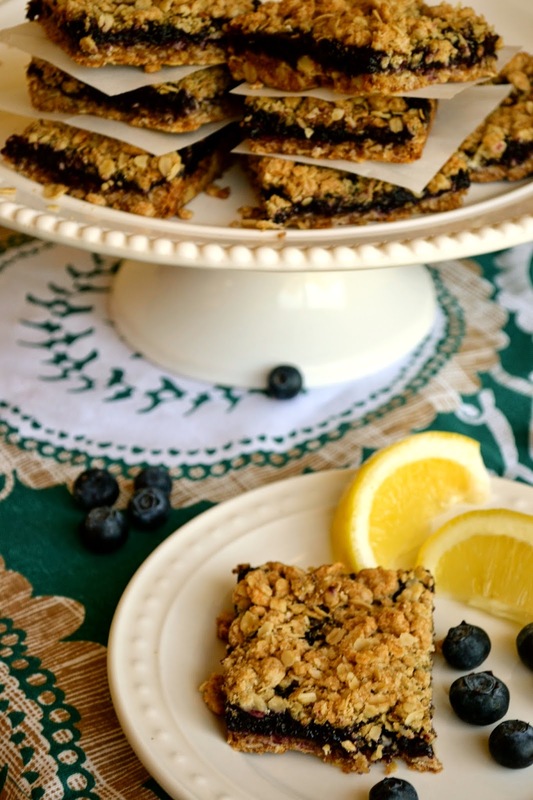 And on those days, I make these blueberry lemon bars with a tart blueberry filling on crumbly oat and brown sugar crust. There's something about the buttery oat clusters on top of that sticky, jammy filling that takes me back. I'm not certain but I think Sao would approve. In saucepan, bring blueberries, sugar and water to boil; reduce heat and simmer until tender, about 10 minutes. I've always made this recipe with fresh blueberries because well, there's something about fresh blueberries! You can certainly use frozen blueberries but you may need to use less water since frozen berries tend to get a bit mushy when thawed. Whisk cornstarch with the 4 teaspoons of water until no cornstarch lumps remain. Whisk in cornstarch to blueberry mixture and boil, stirring, until thickened, about 1 minute. Remove from heat. Add lemon juice and lemon zest to blueberry mixture and mix. Pour mixture into a covered bowl. Refrigerate until cooled and bearing a consistency similar to that of a jam, about 1 hour or up to 1 day before using. 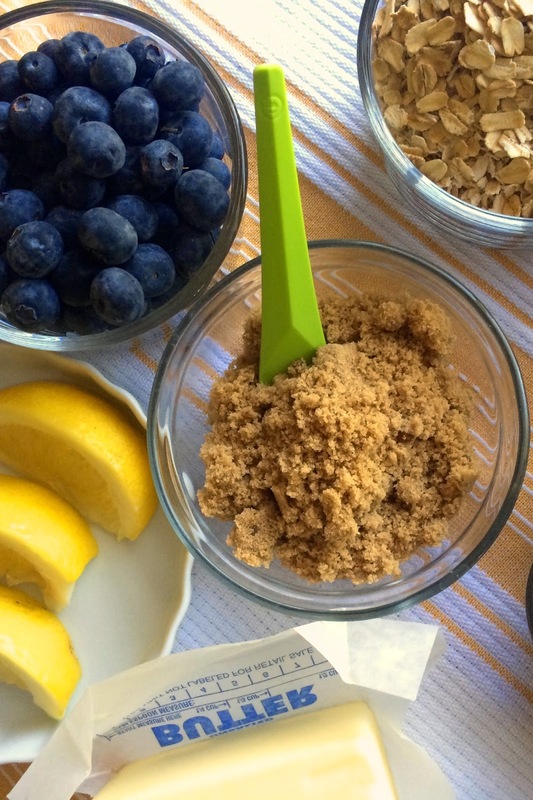 In a large bowl, stir together oats, flour, brown sugar, salt and baking soda. Add butter to form a crumbly mixture. Reserve 1 1/2 cups of crumbs; pat remaining dough evenly into the bottom of a greased 9 x 13 inch pan. Spread blueberry mixture over the base. Crumble reserved amount of the base/topping over the blueberry mixture. Bake at 350F until light golden, about 40-45 minutes. Let cool completely on rack before cutting. That sounds like a really cool neighborhood and even though I never set foot in it, I'm sad it's no longer there--I think I would have liked Old Time, if only for the people watching. The blueberry jam looks pretty divine--I'll have to try it once blueberries are in season. These look oh so good and I bet they smell amazing with that lemon! YUM! Aww I had no idea your parents owned a coffee shop! Sounds like an amazing place. Especially if they served these bars, which have two of my all time favorite fruits in them! How cool that your parents owned a coffee shop...they seem to be so adventurous and forward-thinking. I love that! Totally agree with Mom Chef that this story reminds me a bit of You've Got Mail. I'm glad you have some great memories (and amazing recipes) to look back on! This looks amazing. Love the combination of blueberry and lemon! I much prefer quaint, local coffee shops to the mass trendy ones! 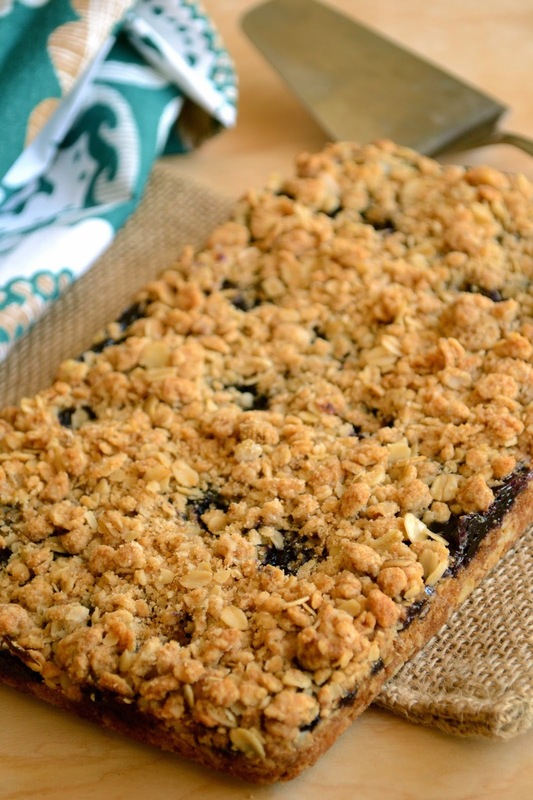 Nothing beats a home made blueberry bar and a good cup of coffee! Z @Kicking Kilos, you can probably swap the oats for flour. I haven't tried it but would love to hear if you do! Smile. I love a good pastry with my morning cup of coffee. These look delicious. Loved hearing your recollections about the shop too!